Care for skin during pregnancy with the Erbaviva Mommy Belly Butter; a moisturising balm that pampers and protects the tummy, leaving skin soft and nourished. The butter is fortified with a skin-loving blend of Cocoa Butter and Carrot Seed oil, which envelops the tummy in a veil of essential moisture. Also enriched with organic essential oils Lavender, Mandarin and Sandalwood, the fragrant hydrator seeks to reduce the effects and appearance of stretch marks, as well as easing feelings of itchiness. Expect calm and comfortable skin that is soft, smooth and well cared for. 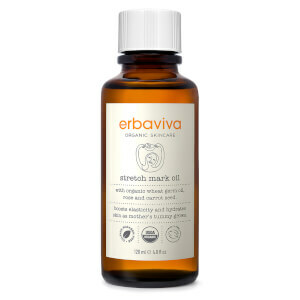 Apply liberally over belly, breasts and thighs to keep the skin nourished and smooth. *Helianthus Annuus (Sunflower) Oil, *Theobroma Cacao (Cocoa) Seed Butter, *Cera Alba (Beeswax), *Rosemarinus Officinalis (Rosemary) Extract, *Lavandula Angustifolia (Lavender) Oil, *Citrus Nobilis (Mandarin) Peel Oil, *Santalum Spicatum (Sandalwood) Oil, *Daucus Carota (Carrot) Seed Oil, *Pelargonium Graveolens (Rose Geranium) Flower Oil, *Rosa Damascena (Rose) Flower Oil. *Denotes Certified Organic Ingredient.